Have you ever seen a bright red wagon oxidize and eventually rust? This oxidative process can also be found inside the human body. However, this process carries with it some negative side effects, including the production of free radicals. Studies have shown that free radicals affect normal healthy collagen and elastin, histamine production and circulation. Proanthocyanidins (OPCs) are the most efficient natural way to neutralize free radicals. By doing this, they reduce oxidative damage to vital tissues. Choice 50 contains pure, premium grade grapeseed extract, along with other powerful antioxidants and synergistic ingredients that help protect the body from the effects of free radicals such as: bilberry extract, quercitin, rutin, curcumin, milk thistle and resveratrol. Choice 50 features a guaranteed 95 percent source of Oligomeric Proanthocyanidins (OPCs) from grapeseed, the highest standardized content available for the most effective antioxidant support. 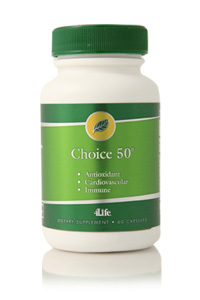 Choice 50 contains bilberry for additional support of healthy eye function. "In September 2004, my wife began taking the Fibro AMJ system, Choice 50 and 4Life Transfer Factor Advanced Formula to help support healthy joints. She really feels like these products have supported the health of her joints. She enjoys the wonderful freedom of movement." "All my life I have suffered with a variety of health issues. I’ve been taking RiteStart for Women, Transfer Factor and Choice 50 for over a year now, I have enjoyed feeling much better and have noticed that my immune system has been much stronger." "I’m in excellent health and have been for several decades. Over the past five years that I’ve been consuming 4Life Transfer Factor, I can honestly say I have reached a higher level of health than I ever thought possible."